Penniless, and escaping the horrors of life as a governess to brutal households, Maud seeks refuge with the cousin-by-marriage she never knew. But Juliana quashes Maud's emerging friendships with the staff and locals - especially John, the artist commissioned to restore the sinister Doom in the local church. John, however, is smitten with Maud and makes every effort to woo her. Maud, isolated and thwarted at every turn, continues to take the laudanum which was her only solace in London. Soon she becomes dependent on the drug - so is this the cause of her fresh anxieties? Or is someone - or something - plotting her demise? 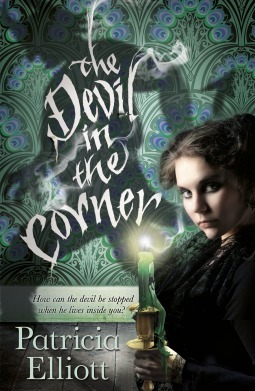 Is the devil in the corner of the Doom a reality, or a figment of her imagination? I received an ARC of this book through NetGalley for an honest review. Maud Greenwood's life could not be getting any worse. Orphaned at a young age, only the good education that allowed her to seek jobs as a governess has kept her out of the streets. Until people stop hiring her. Maud is in the brink of despair when, like in a fairytale, her salvation comes in the form of a letter. A relation she knew not of, by the name of Juliana Greenwood, offers her a roof and, upon Juliana's death, her very own fortune. All Maud must do is go to Juliana and keep her company until her life is whisked away. Without a second thought, Maud leaves to the countryside. But not all is as idyllic as one would suppose. There a shifty characters in the village of Rending and even Juliana is not quite the old, sick lady painted upon the letter she had written. To finish the picture, a huge painting of the apocalypse hangs above their heads in the church, fomenting the imaginings of peasants and nobility alike, making nothing exactly what it seems. And of course that an addiction to laudanum could never do much good. Despite a difficulty on my part to feel for and connect with any of the characters, kudos must be given to Elliott for creating such flawed people. She took a completely different turn than most Young Adult authors when it comes to character creation, as all her cast had at least one very clear major flaw that was not toned down by their "goodness". Indeed, many of her characters are very easy to dislike as people, including Maud herself. The atmosphere too was created quite well, especially on the second half of the book. The novel as a whole is poignantly creepy and, as the story develops, disturbing. One is never quite sure of the facts, of who is imaging things and who is telling the truth. It is easy not to believe anyone and believe everyone at the same time. And yet, odd as it may sound, the end was predictable. However, I would not deem the book flawless or anything close to it. A good portion of the book seemed like it was no more than Maud slowly going insane as she took care of Juliana's ministrations. I am aware that it was attempted to recreate a Gothic novel, but still the pacing felt too slow for the majority of it. Only at the end did it pick up and become the page turner it should have been from the start. That is especially true when one considers the mysteries surrounding Maud's past. Albeit the fact that I enjoyed them not being fully undisclosed, more could have been done with them. It could, for an instance, have been used to develop Maud's relationship with John. A relationship which I am glad of, for the romance was not overplayed as is the norm, even if it did threaten to happen for a while. In short, The Devil in the Corner is an interesting read, and a book I would never have associated to the Young Adult genre due to its inherent darkness.